All transactions are safe and secure with a reliable history in online purchasing behind each of our associates. Buy the Sopranos Bada Bing Hoodie to own Sopranos clothing and merchandise. Despite being known locally for his personal and professional associations with the underworld, Tony Soprano has represented himself publicly as a waste management consultant for Barone Sanitation. The company is one of the many fronts for his criminal enterprises. He often holds meetings in his office at the Bada Bing go-go bar. Wear the Sopranos Barone Sanitation t-shirt under the Bada Bing Sopranos hoodie sweatshirt on the left. Wear it with Bada Bing Sopranos hats. 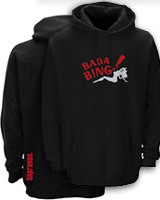 In addition to the Sopranos Bada Bing Hoodie above, browse the Sopranos Clothing Gallery for more apparel like men's and women's clothes, kids shirts or hoodies.